Recently I asked Pete Fallico if he would be interested in writing liner notes for my upcoming CD. I was thrilled to hear that he was. But even more so when he asked me for an interview on his pod “The doodlin’ lounge”. Yesterday he called me and we had a nice chat. The pod is already online, so do take a listen! One of the highlights of last year was to do a few concerts witht my trio. We’re making a new album in the beginning of next year and got to try out some of the songs that we’re recording. Here one of them, my song Trìtlar, named after an Icelandig candy. Enjoy! New CD out with Claes Janson! 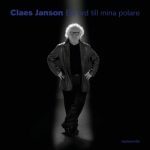 October 25th was the release date of Claes Jansons new CD, “Ett ord till mina polare”. All with Swedish lyrics and mostly original songs, except two Ray Charles covers (with new Swedish lyrics). Arnesen Bluesband did the accompaniment for about half the tracks and on them I play the B3. We also to the full live shows with Claes. The record has quite a span musically, ranging from some bluesy heavier tunes to soft ballads. Check it out! I’ll post a few links below. As a part of Stocksholm jazz festival, Hans Bollandsås & Andreas Hellkvist In Concert will be playing at Stampen on October 17th. Here’s a clip from last time we played there. A version of BB King’s Heartbreaker. Enjoy! I about two weeks I’ll be playing and recording with the trio. Two concerts, one live video recording and one studio recording. Really looking forward to that! I put together a little promo clip with an organ solo from a concert last year. The is a composition of mine with the working title D-funk and will be featured on the recording. Enjoy! Read more about the trio.